The average household spends at least 10 percent of its energy budget on lighting. When people think of energy efficient lighting, many think of creating alternative energy; however, this can be expensive and costly to maintain. A new trend has become more affordable. Daylighting is a technique that captures natural light to illuminate your home. Using daylighting and bright, lower power consuming lighting for evening hours allows for minimal power consumption with a smaller upfront investment. Nothing is better than natural light and when it comes to energy use, nothing is more efficient. During the day, a skylight or properly positioned window provides as much light as several light bulbs. A design around daylighting uses natural light from windows, skylights, and solar tubes to light your Calgary home during daylight hours, and highly efficient LED and florescent lights that are three to four times more efficient than incandescent lighting, for evening hours. 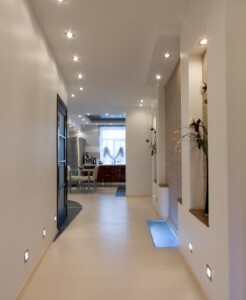 Combining daylighting techniques with light sensors, LED bulbs, fluorescent lighting, and the right type of lighting for every room will light up your beautiful Calgary Home! Light sensors can automatically control lights inside or outside your Calgary home. Sensors can also detect how well a room is lit and raise or lower your lighting to more comfortable levels. Simple light sensors are often part of a security system or garage door opener. Many different types of sensors exist and each one works in a slightly different way. Solar tubes look a lot like spotlights. Also known as sun tunnels, sun pipes, sun scopes, light tubes, and daylight pipes, solar tubes are cylinders used to bring natural light into your Calgary home. Replacing or enhancing electrical lighting, solar tubes are installed on the roof and allow natural light in, much like a skylight. The most common solar tubes use reflective material inside the tube to direct amplified light into the room below. A clear dome at the top of the tube directs light into the room. On the inside of the ceiling, a diffuser can be used to spread throughout the room. The light is brightest if the tubes are short and straight. Solar tubes work well in any room, but are a good choice for hallways, closets, or rooms without much natural light from windows. This strategy is widely used for office space and makes sense for your Calgary home. Illuminate a desk or kitchen table by installing solar tubes where you work during the day and tracks of recessed lights to illuminate areas where you work at night. LED bulbs come in a range of color temperatures. For the kitchen in your Calgary Home, lighting with a higher Color Rendering Index and color temperatures of 5000K to 6500K and are best. CRI is a measure of how “true” colors appear under a given light. The sun has a CRI of 100; anything higher than 80 represents colors close to the way they appear in sunlight. Compact fluorescent lighting is an excellent option for your kitchen if you don’t want to invest in LED technology. While high color temperature bulbs are best for kitchens, the bathroom needs lower color temperatures that resemble incandescent bulbs. Compact fluorescent bulbs with color temperatures about 2700K are a good choice. For the living room in your Calgary home, compact fluorescents with warmer color temperatures provide good lighting. Lamps with 6500K provide bright white light with a hint of blue; if you prefer a more traditional lighting style, choose color temperatures in the range of 2700K to 3500K. While a small ambient light will guard against eye strain, lighting with a dimmer switch is best for the media room in your Calgary home. Compact fluorescents can be matched with dimmer switches. Warmer color temperatures are optimal, because they match the color temperature of movies and TV. Choose a wide range of options for lighting the bedrooms in your Calgary home. For reading, you’ll want high color temperatures of 5000K to 6500K. Other times you might want lower color temperatures of 2700K and at times you may want low lighting and a dimmer switch.